​After the launch of the Hunter Valley's advertising campaign, which celebrates "the good life", we asked some locals what living the good life means to them. ​I feel I live the good life in the Hunter Valley for a number of reasons. I have the opportunity to raise my kids on a small five-acre property with 50 fruit trees, a large vegetable garden, a one-acre chicken run, pigs, dams, sand pit, cubby house and pool with beautiful views of Lambs Valley and Barrington Tops. They have fun, adventures, jobs, responsibilities and just get dirty. For me, being able to step out of the everyday high pressures of running a fine dining restaurant and step into the veggie garden or put on my headphones and jump on the ride-on mower for a few hours is just what the doctor orders. I enjoy drinking good wine, eating great food and the locality to the beaches, lakes, Newcastle and family is fantastic. 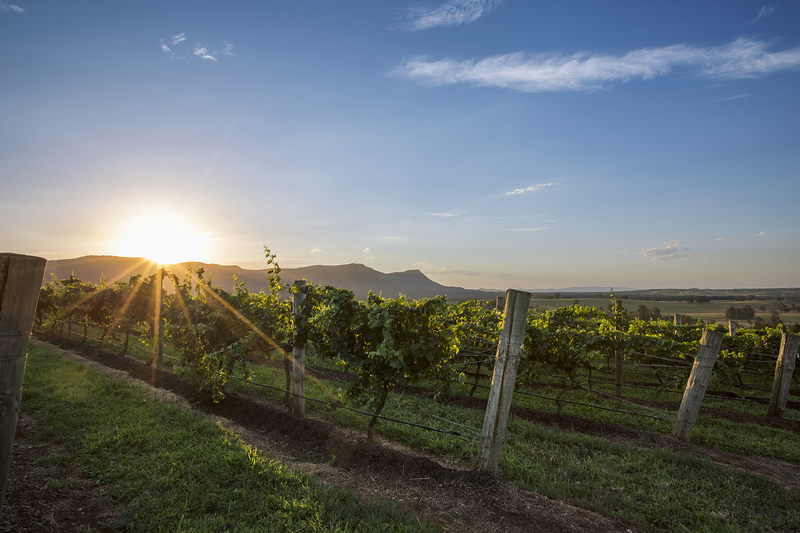 ​For us, the secret to living the good life in the Hunter Valley is getting up early! We are both hot-air balloon pilots so early mornings are part of the job. It's also, we believe, the best part of the day and showcases the beauty of the Valley at its finest. Being up early, a good breakfast is essential. Luckily there is no shortage of great breakfast options if you know where to look. Nic and I are both vegetarians and the vegetarian brekky at Peterson House is certainly a favourite. Free-range eggs, sautéed button mushrooms, asparagus, grilled vine tomatoes, baby spinach, rosti and thick-cut toast – it's delicious and also very filling. You can't go past their pancakes either which change depending on what's in season. The best thing about the Hunter Valley is that it is always evolving. There are always great new places and experiences to try. ​Living the good life to me means taking the time to stop and enjoy the scenery and the natural world, both in vineyards and around the rural landscape of the whole Hunter. I love the surprises of the wildlife in the vineyard – kangaroos, of course, but also eagles, ladybirds, lizards (maybe not the snakes), the colourful cover crops, the light off the Brokenback Range in the late afternoon, as well as the crashing coastline and the Watagans after wet weather when beautiful fungi and mosses appear and the pungent damp forest smells rise up and mingle with the mist. I am always taking snaps with my iPhone or DSLR Canon 6D and sharing on Instagram. Other things that make life good are a vibrant veggie patch which leads to seasonal eating, preserving the oversupply and the pleasure of sharing homemade preserves and pickles with friends; escaping to Newcastle for restorative swims in the heat of summer; sneaky lunches with great wines in our workwear where the local chefs don't mind our lack of glamour. But the sense of community that underpins it all is the best thing. ​I have a millennial mindset like most of my friends – we want to live the good life right here, right now and that's super easy here in the Hunter. What's great about the Valley for someone my age is that we have the country lifestyle but because it's a tourism-based area there's always something to do – restaurants, wine-tasting, markets and concerts. I go to concerts all the time. I'm going to Shania Twain in December, love A Day on The Green and Hot Dub Wine Machine was fantastic. You don't go out to a concert at my age without going to Harrigan's Irish Pub afterwards. That's the insider secret to topping off a good concert. Since I've been old enough to appreciate fantastic food, I've always loved going to Robbie's [Robert Molines' restaurant Bistro Molines], but if I'm going for a long lunch I head to Baumé Restaurant at Ben Ean. My idea of a perfect breakfast is poached eggs and avocado at Cafe Enzo. Yes, I love avocado and eat it every day! Most people I hang out with base their whole lives around food and wine, and I wouldn't have that appreciation without my parents. I got my appreciation for wine from my Dad and for beautiful food from my Mum. I wouldn't have this good life if it wasn't for my grandparents and my Dad, who started Petersons Wines in Mount View.